All aboard! Let the Chintzyiest Chef be your culinary conductor for a tasty ride to cheap dining along LA's latest transportation hub: the Expo Rail Line. This post is for the locals and curious tourists who explore this great city of Los Angeles using public transportation. Our long overdue rail system has finally arrived in Baldwin Hills and Culver City, and the latest stops are right in my neighborhood! 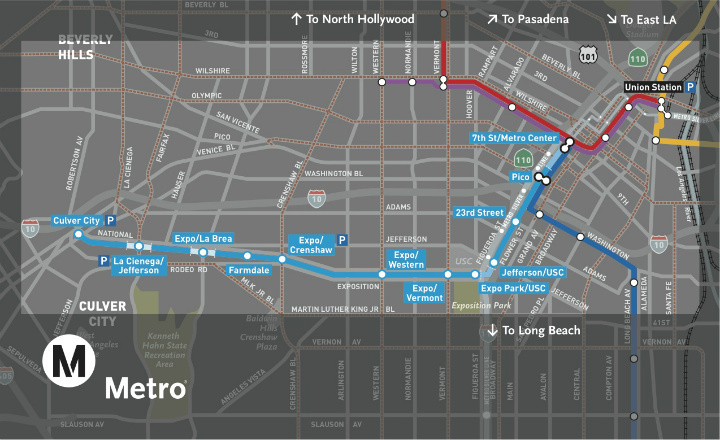 It's an 8.6-mile, 12-station track with 10 new station stops, traveling parallel to the Santa Monica 10 Freeway from Downtown to Culver City. To celebrate, I've compiled some of the videos I've previously shot of local inexpensive eateries within walking distance of three close-by station stops. And, after each video is a link to my original post with an exact address, so you can easily google map these fine fooderies! 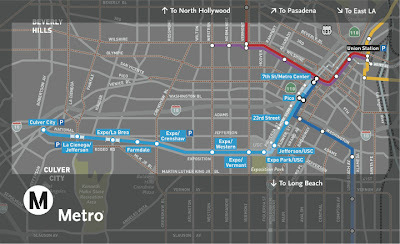 The Expo Line opening ceremony is downtown on Friday, April 27th, with free admission Saturday and Sunday. The Freeloading Culinarian will be riding the rails this weekend with camera in hand to record the festivities. 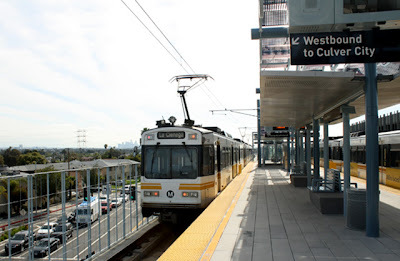 I've been riding the rapid transit rails on each opening day, including: the Red Line from Downtown LA to North Hollywood; the Purple Line to Mid-Wilshire; the Gold Line to Pasadena and East LA; and now the Expo Line that runs from Downtown LA to Culver City. For complete blogpost click here for the address, photos, and a full review. First up is the Crenshaw Boulevard stop. There are a couple of cheap and delicious restaurants on this colorful street: Earlez Grill for fabulous hot dogs and Chef Marilyn's Soul Food Express. To reach Earlez Grill, just step out out of the rail car at Exposition and Crenshaw and you are there! The Saturday special beef and turkey dogs will set you back just $1.25 - that's lunch for about the fare price of a one-way Metro ticket! I can also recommend the specials: on Mondays, it's the Special Veggie Dog for $2: it's a grilled plump wiener that tastes way too good to be meat-free. Friday's Special is a fiery Beef Link for $2.50. I'll just let Duane, the proprieter of Earlez Grille, give you the lowdown on his grilled wiener fiefdom in the video below. Unfortunately you only have a couple of months to eat at Earlez in this location. The transit authority is paving this tube steak paradise to put up a commuter parking lot. I hope Earlez Grille stays nearby in the hood. Also near the Exposition/Crenshaw stop - when you walk three blocks north on Crenshaw - is Chef Marilyn's Soul Food Express. Chef Marilyn, a former Lakers cheerleader, cooks up some real Southern-style cuisine, including: Mac and Cheese, Collard Greens, Smothered Chicken and Pork Chops, Baked Fish and of course, Fried Chicken and Catfish. They even have a slew of 99 cent specials (the ones I always get), including: Hot Links, Spinach and Black-eyed Peas. These are some of the best meal deals around. Moving further west, the rail stop at La Brea Avenue is adjacent to the venerable Popeye's Fried Chicken. While not locally owned, this tasty fast food join fits the neighborhood of Southern transplants hungering for cheap fried fare. 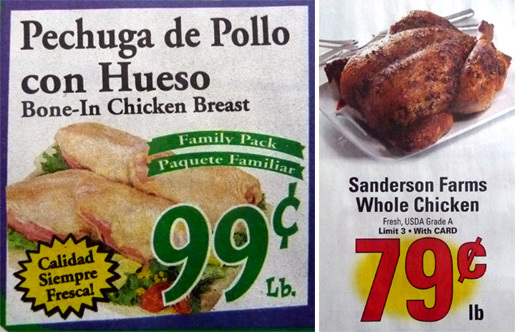 On Tuesdays, you can't get cheaper than the 2-Piece Special for 99 cents. You'll get a spicy or regular seasoned leg and thigh, and it's finger-lickin' good. Just watch the video below of: "My 99 Cent Dinner with Nuno." If you hanker for another low-cost Southern treat, you can walk off the fried chicken to get to one of the best bargains in the city. 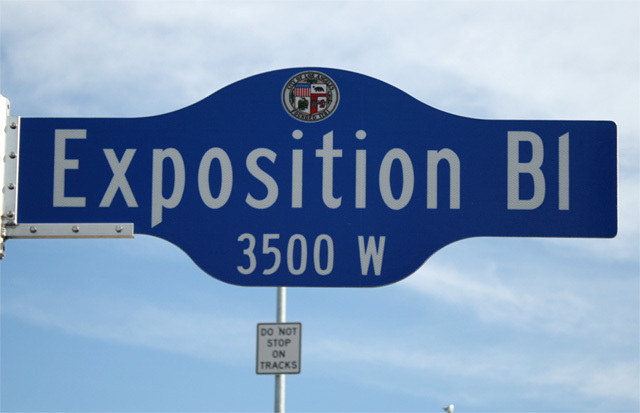 Take La Brea one city block south to Rodeo, then head east to (Martin Luther) King Boulevard. A short 2 blocks later, you're at Cajun's Fried Chicken, were they offer a hearty Gumbo for $1. It's a satisfying serving loaded with sausage, chicken, bay shrimp, veggies and rice, in a spicy flavored broth, as the closeup videography below will attest. Those rail riders with a sweet tooth - or a sweetheart to impress - can continue west to the next stop at La Cienega Boulevard. 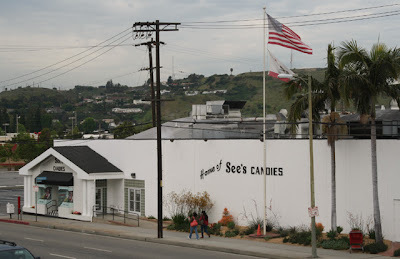 From the elevated train stop there, you can see the original headquarters of world-famous See's Candy, just a half-block South on La Cienega. You'll smell the roasting nuts and melted chocolate before you get there. This is the original building where the classic scene from "I Love Lucy" - in which she stuffs her face to keep up with a fast-moving assembly line - was shot in the 1950s. It's still open for business, with so many new flavors to try. Of course, samples are free, and I've had plenty! The last low-cost Expo Line eatery shown here is in Culver City, so you won't be able to reach it by rail until this summer, when the eastern-most stop is due to open at Venice and Washington Boulevard in June. Just a block away, walking east on Washington, is the Helms Bakery, which anchors a collection of shops and eateries including Father's Office, which grinds out the best burgers in town if you believe half the local bloggerati and newspaper food reviews. But they're too expensive for this miserly chef. Instead, I head right over to the hot dog hut in the parking area for grass-fed, free-range and hormone-free beef, pork, veggie and poultry wieners from Let's Be Frank. The simple setting belies their organic and artisanal creativity. 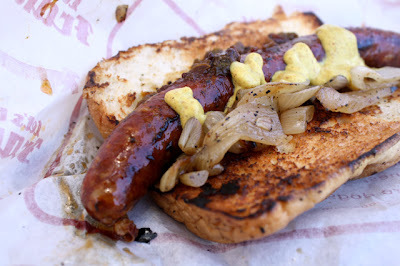 These unique hot dogs are dang good -- even the toppings are locally sourced and homemade. For about $5 you get a larger-than-average tube steak -- that is more ground sausage than your typical ballpark frank. With all these tips, you're well-equipped to enjoy the Expo Line without blowing the budget. So hit the rails to start exploring, and Bon Appetit! Who am I kidding? I'm just too lazy peel a pile of tomatoes and squeeze out the seeds, (after scoring and blanching them,) to make a chunky fresh tomato sauce. 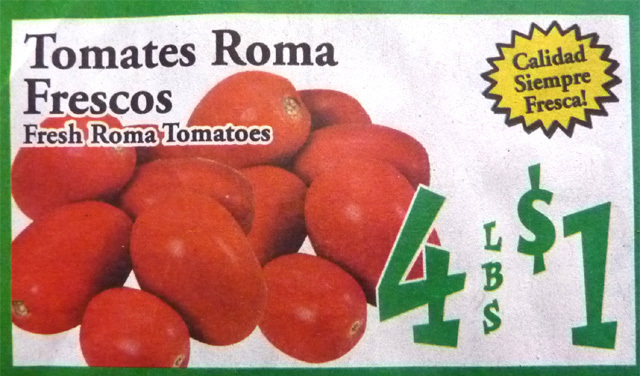 Plus, I need to rid the refrigerator crisper a half-bag of tomatoes starting to get some brown spots! 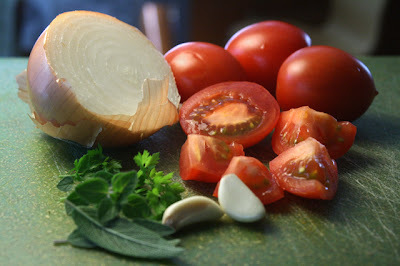 For this recipe, all I'm doing is roughly chopping some tomatoes, adding them to sauteing garlic and onion, then finishing it with a drizzle of olive oil and some chopped fresh herbs, and calling it a Rustic Tomato Sauce. This delicious recipe is a no-brainer, and impossible to mess up. Leaving the skin on the tomatoes, and using the seeds, is a no-waste method that is as tasty as a typical perfectionist-chef made-from-scratch tomato sauce recipe. The skin is soft enough and the seeds are so small -- who cares if it doesn't look perfect. My local Persian and Latin markets sell them for around three pounds per dollar, so it's even cheaper than canned. Now, this is another excuse for you to check out local immigrant enclaves for fresh produce -- so, get to know your foreign language speaking neighbors, you might save a few bucks. Now it's time to put in the tomato plants, and in a few months you can look up this recipe -- that is, if you get a bumper crop! 2 cloves garlic - fresh chopped or from jar. About 1 teaspoon. 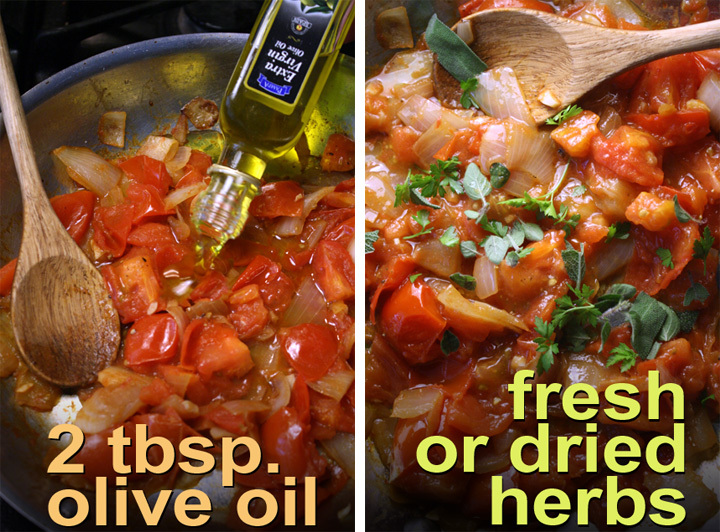 3 tablespoons olive oil - or a tasty oil. 1 tablespoon is for sauteing onion, and 2 tablespoons just before serving. 1 teaspoon chopped herbs - optional. Okay to use a favorite, dried or fresh. I used parsley, oregano and sage. Parmesan - optional, dried or fresh shaved. To taste. 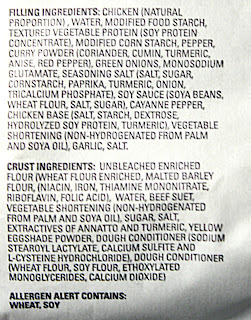 1/3 package favorite pasta - cook to package directions. Begin to boil water for pasta. 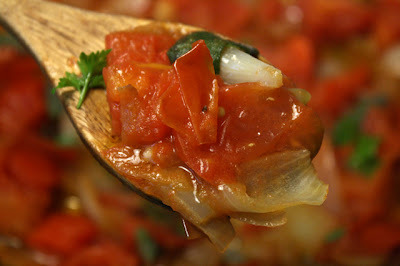 Heat large pan (enough to hold tomato and onion) with 1 tablespoon of oil. Roughly chop 1/2 onion and add to heating pan. Cook over a medium heat until soft, about 5 minutes. As onions soften, time to start the pasta, just follow directions. 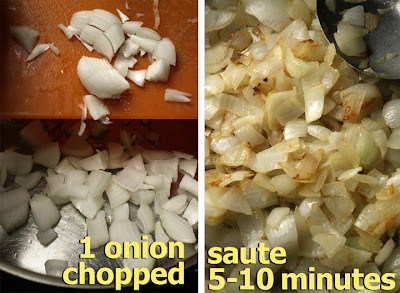 Add chopped garlic to onions. Saute garlic for a minute. 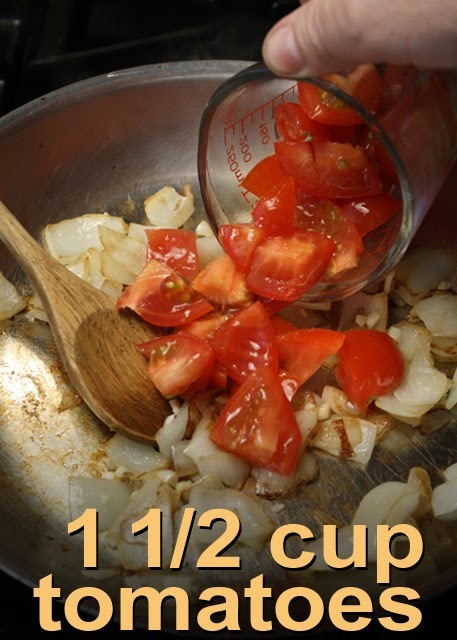 Roughly slice tomatoes and add to sauteing onions. Mix well. Salt and pepper to taste. Add dried herbs. This is were you have the choice to cook tomatoes until semi-soft (about 3 minutes) or completely soft. I cooked tomatoes about 5 minutes. 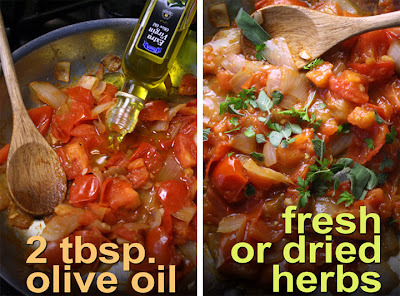 Just before tomatoes are done, add 2 tablespoons of olive oil (optional.) Sprinkle on chopped fresh herbs. 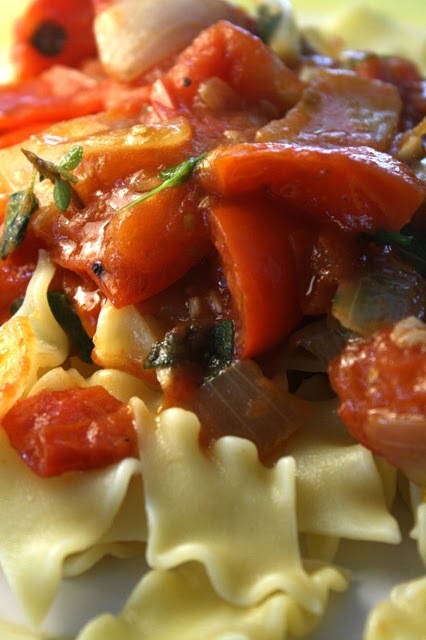 Mix well and serve over favorite pasta. Add parmesan if you have it. My Rustic Tomato Sauce is the base flavor for any fresh veggies or protein you have on hand. Add a small can of tuna, sauteed chicken, or sausage. Zucchini, broccoli , spinach, asparagus, black olives -- almost any veggie you have on hand can be added as the tomatoes soften and saute. This is an easy recipe to expand for any surprise guests. Just add a few more tomatoes. Coo yah -- dis Deal of the Day practically jumped off a shelf, mon. How could you pass up an exotic Jamaican Style Chicken Patty? The Raggamuffin Chef got it from dat frozen deli case in dehya Dollar Tree store. 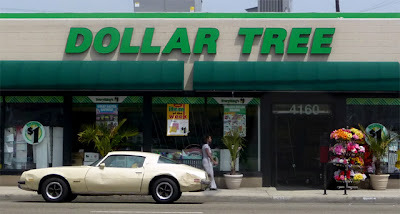 Dollar Tree's are a Middle-American version of our West Coast Babylon Los Angeles 99c only Stores. Dis one did not have fresh produce, but carries a lot of frozen items, along wit canned veggies and packaged rice, pasta and other food stuffs. Not a bad selection, but nowhere near the variety or fresh fruits and veggies you get at local 99c only Stores -- yet. 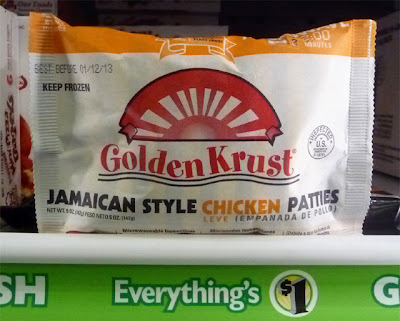 A frozen deli case stocks frozen fillets of fish (Pollack), small head-on uncooked shrimp, 3.5 ounce ribeye steaks, and frozen cooked items like corndogs, and these Jamaican Style Chicken Patties. This rude bowy grabbed one and paid a buck -- the fluffy checkout lady said they were good, too. Her authoritative tone made me want to slap it in the office microwave when I an I got back from my ten toe turboing. But I an I didn't bring deh camera to record this Deal of the Day, so I an I brought it home to cook over a weekend, and here's the result. It's a pretty good deal and I an I would get it again. It's a microwavable meal: cut a slit in deh package; place it on a plate; microwave in the "crisping" package for 2.5 minutes; allow it to cool for a minute; and finally chow down. Named a patty, I an I was expecting something like a crab cake -- it's more like an empanada. 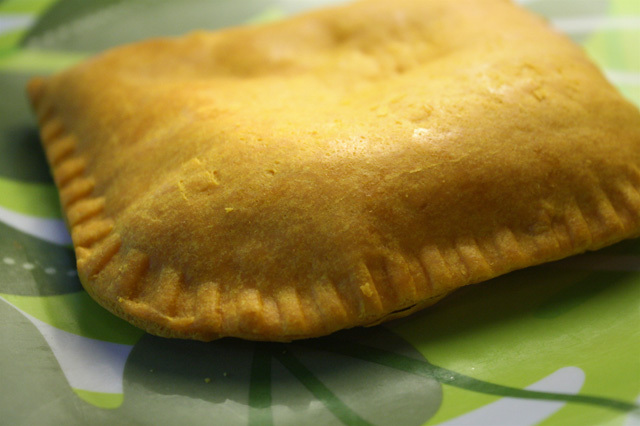 A large flaky bright orange crust surrounds curry-spiced gravy wit shredded chicken. 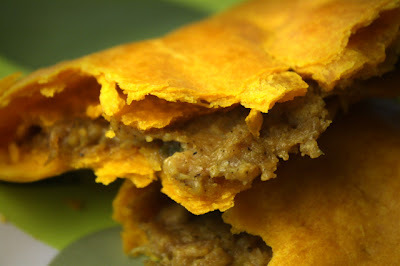 It's a generous three-by-five inch stuffed meat pastry, almost enough to fill any wanga-gut. A bad news is I an I couldn't find the chicken. It was so shredded, or ground up, that the filling was a mushy mess -- although a tasty one. And a ratio of chicken curry sauce to pastry was off -- definitely more stuffing was needed. But for a buck it's a decent Deal of the Day loaded wit positive vibrations. Made by Golden Krust Caribean Bakery and Grill (website click here), I an I would definitely try any of their other products, mon and recommend them to all my bredren. So on a scale of 1 to 9, with 9 being best, the Stulla Chef, gives Jamaican Style Chicken Patties a solid 7. Click here for italicized Jamaican slang translations. I like cooking with herbs and use them any way I can. 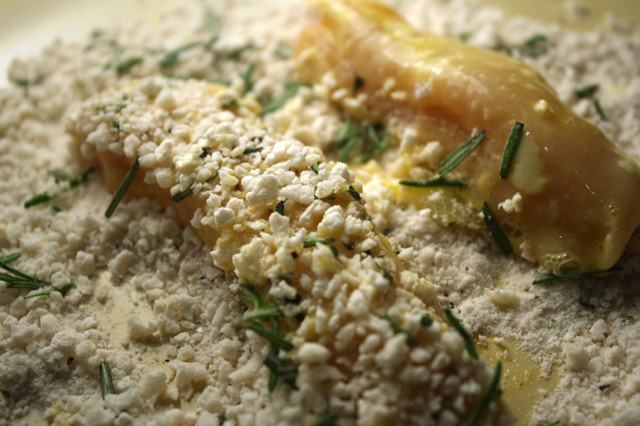 In the cheapest culinarians latest recipe, fresh rosemary provides a pungent kick of flavor to often bland Chicken Tenders. It's a simple addition that makes all the difference. 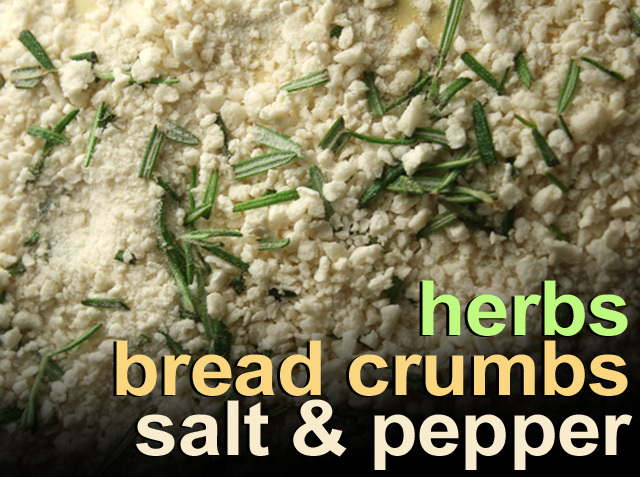 Just chop any fresh herb you have on hand and add it to dried bread crumbs -- you could even use dried herbs. If you are looking for a subtler taste then go for tamer chopped parsley -- the kids are less likely to push them to the edge of the plate. I've also tried these Herb Crusted Chicken Tenders with chopped sage and oregano. 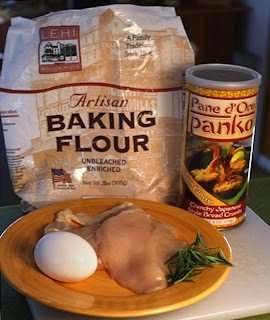 I used chicken breast meat for this recipe, but you could use cheaper leg or thigh meat. 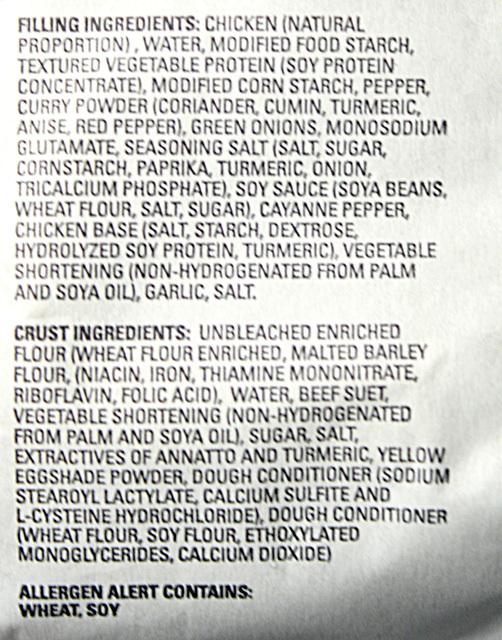 (Even chicken wings or chicken livers would carry the coating nicely.) I often find bone-in whole chicken breast on sale for around a dollar per pound, and dark meat is even cheaper -- if you can breakdown a whole chicken, that's the cheapest way to go. White meat is easier to remove from the bone than dark meat -- but then, dark doesn't dry out as easily. 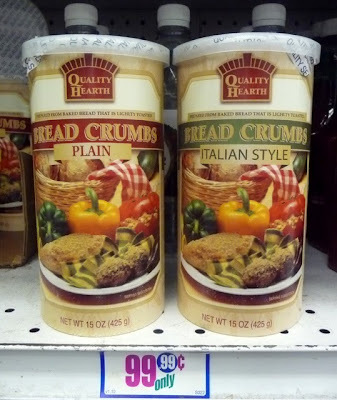 My local 99c only Store usually stocks cardboard cans of bread crumbs, sometimes even Japanese Panco crumbs. It's also easy to make your own, my recipe is here. I fried half the herb coated Chicken Tenders in oil and baked the other half in the oven. The flavor was almost identical, only the appearance was different. Frying gave a more appetizing brown colored crust, but baking is the less greasy way to go. I liked both versions. 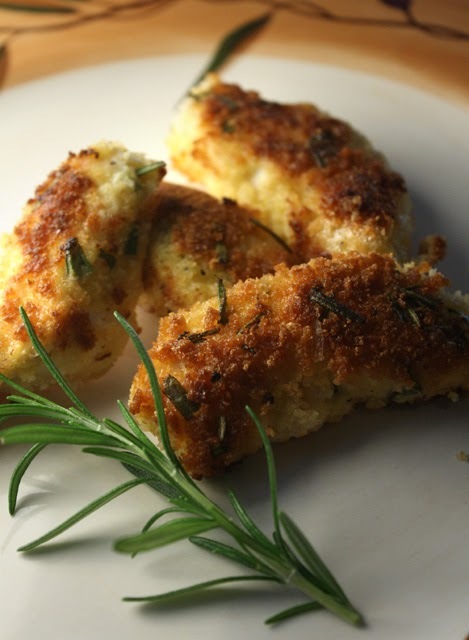 Serve my Herb Crusted Chicken Tenders as party appetizers or the main entree. 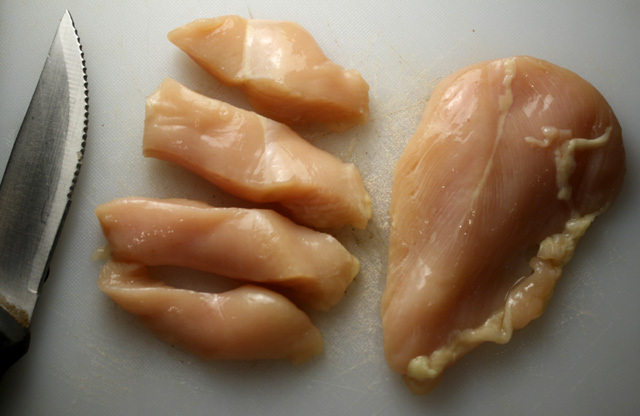 1 whole chicken breast - remove skin, slice off the bone and cut into strips. Okay to use dark meat. 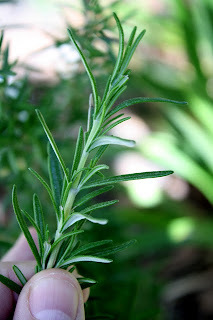 Handful of fresh herbs, or a tablespoon of dried herbs - I roughly chopped a dozen fresh rosemary sprigs from my patio garden. Okay to use any you have growing including: oregano, parsley, sage, etc. 1/2 cup flour - optional. 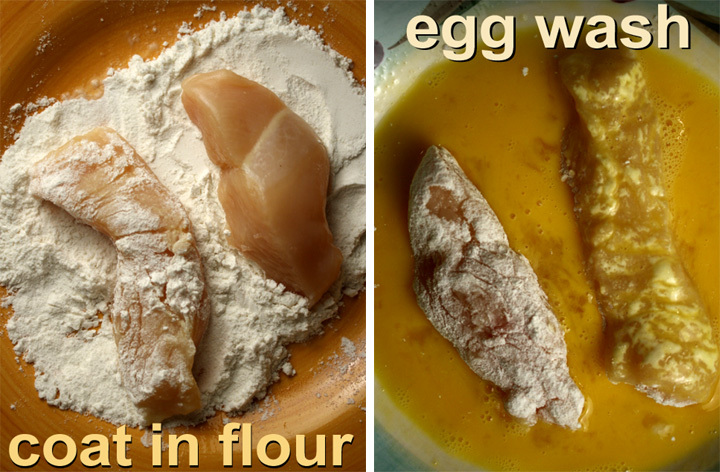 Go from an egg wash to covering in breadcrumbs, if you want a lighter coating. 2 tablespoons of oil for frying - may need to add more. You won't need as much oil if you bake the Chicken Tenders. Salt and pepper to taste - which I mixed into the Panko crumbs. Add 1/2 cup of flour to a shallow plate or bowl. Chop herbs and mix into another plate of bread crumbs. Season bread crumbs with salt and pepper. In a bowl lightly beat one whole egg. Remove skin, from one chicken breast and slice the meat off the bone. Cut meat into strips. I got about 8 -10 strips from a whole chicken breast. Heat 2 tablespoons of oil over a medium heat. 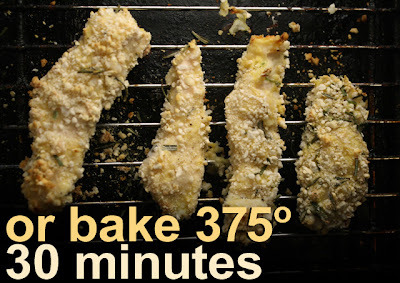 If you are baking the Chicken Tenders then heat up the oven to 375 degrees, and get out a baking sheet or tray with a rack. You can start frying the coated chicken strips in batches. You just need to saute them until done - about 3-5 minutes on each side. 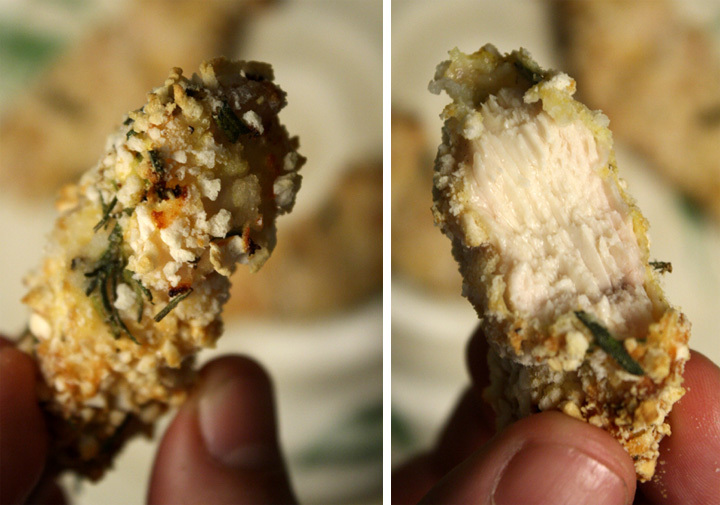 Slice into one chicken strip to check before serving, to make sure juices run clear -- no red or pink liquid. Set aside tenders as they are done, you may need to add another tablespoon of oil for each batch you start. Saute until all the strips are done. Eat them while they are hot! If you are baking them, then just line up the tenders on a lightly oiled pan, or tray with a rack. Cook at 375 degrees for about 30 minutes. You can turn them over after 20 minutes to lightly brown the other sides. The color will be lighter than when frying, but should taste the same. Again, slice into a tender to check for doneness, before serving. Dried lentils cook in half an hour, much quicker than any other dried bean. They tend to get much more mushy than the typical pinto, red or navy bean. I'm not used to cooking with lentils, so it was suprising that my first cooking experience with them turned out so delicious, I hope you will like this recipe, too. I usually have had them in India restaurants, but I've also tried them in Ethiopian eateries. 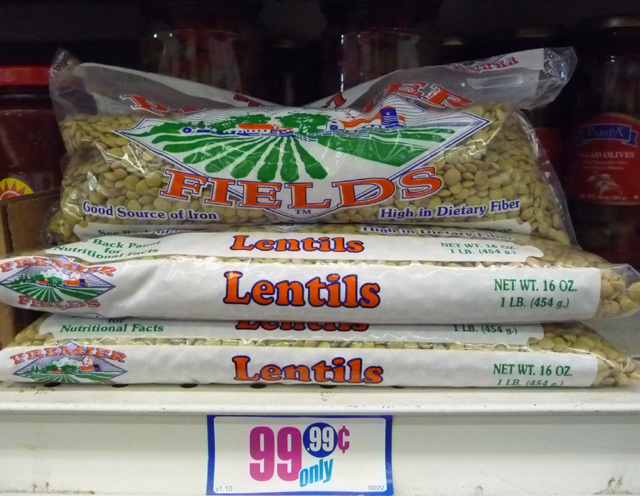 Since lentils are thought to originate in India, they are typically cooked spiced with curry. For my latest budget entree I'm going India vegetarian: Veggie Curry with Lentils. While the lentils are cooking just saute some onion and garlic, then toast some ground cumin, and finally, add coconut milk and canned tomato. I like to bake it instead of stove top simmering -- I prefer the flavor of roasted veggies and legumes. 1 can of coconut milk, juice, or cream (about 13 ounces) - optional. Okay to substitute with a small (about 6 ounce) carton of plain yogurt. 1 tablespoon ground ginger - optional. 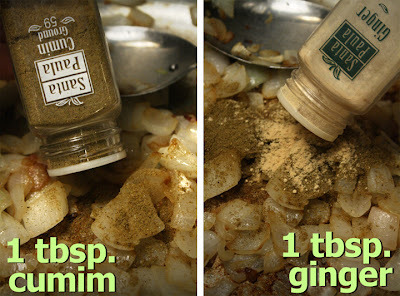 Okay to use a tablespoon of fresh chopped. 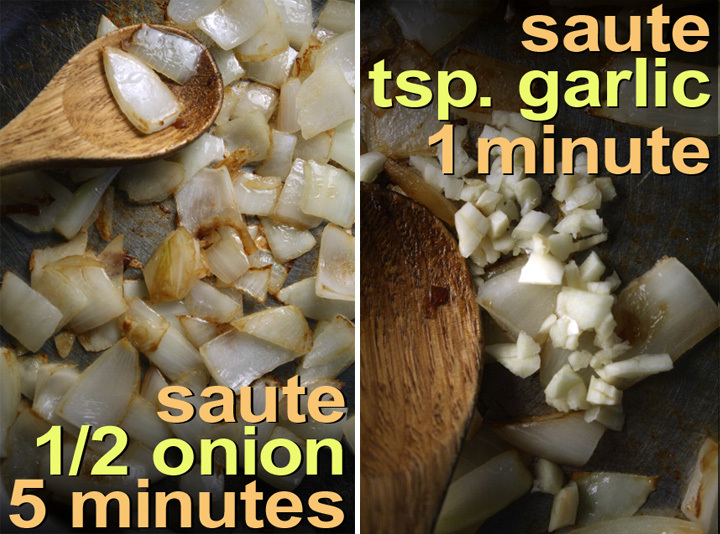 2 tablespoons oil for sauteing onion and garlic. 1/4 teaspoon of cayenne pepper - optional, as you may not like the heat. Can always add hot sauce to individual servings. 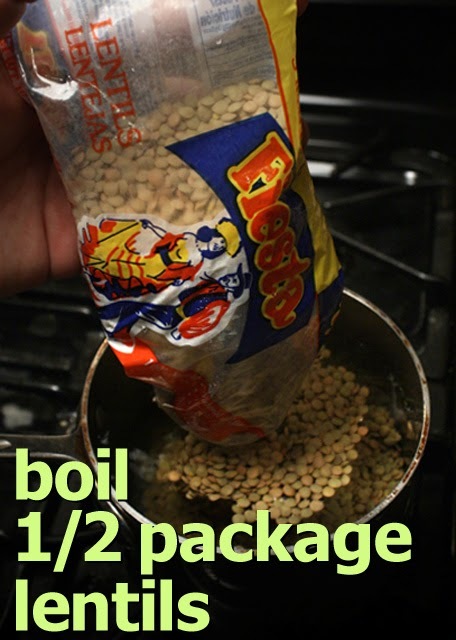 Start the half package of lentils boiling in 3 cups of water for about 20 minutes. Don't worry if they are not cooked all the way through, you will finish the cooking process in the oven, later. 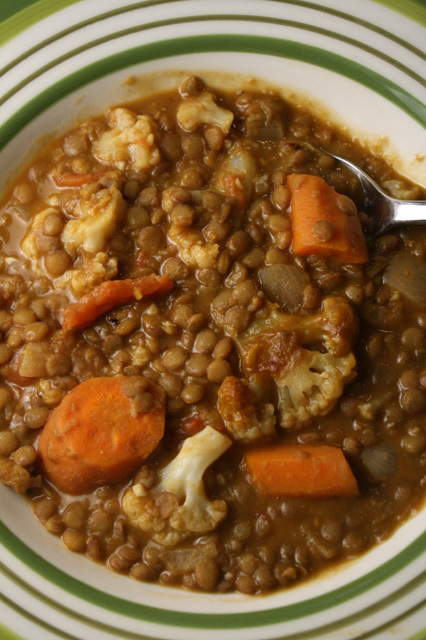 While lentils are cooking, heat oil in a large saute pan, or pot, and add chopped onion. I use a large metal pot with a top that I can put directly into the oven. 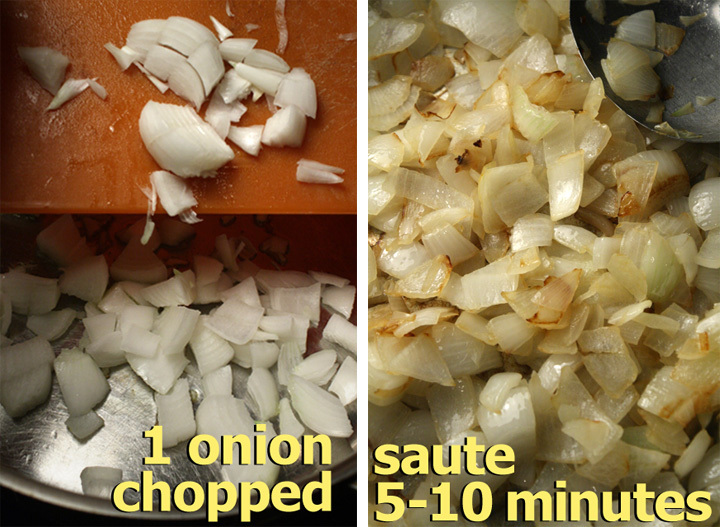 Saute onions about 5-10 minutes, over medium heat, until soft and just starting to caramelize to a light brown. Add chopped garlic, stir and cook for a minute. Add a tablespoon of ground cumin and powered ginger. Sprinkle in a 1/4 teaspoon of cayenne pepper, optional. You can always add it at the end of cooking, a little at a time to desired heat level. Salt and pepper to taste. Stir dry spices into onions and lightly stir for about 3-5 minutes to rehydrate the spice flavors. Mix in chopped carrots and cauliflower florets. 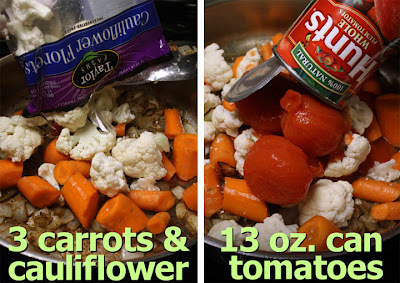 Next add a can of tomatoes with the liquid. 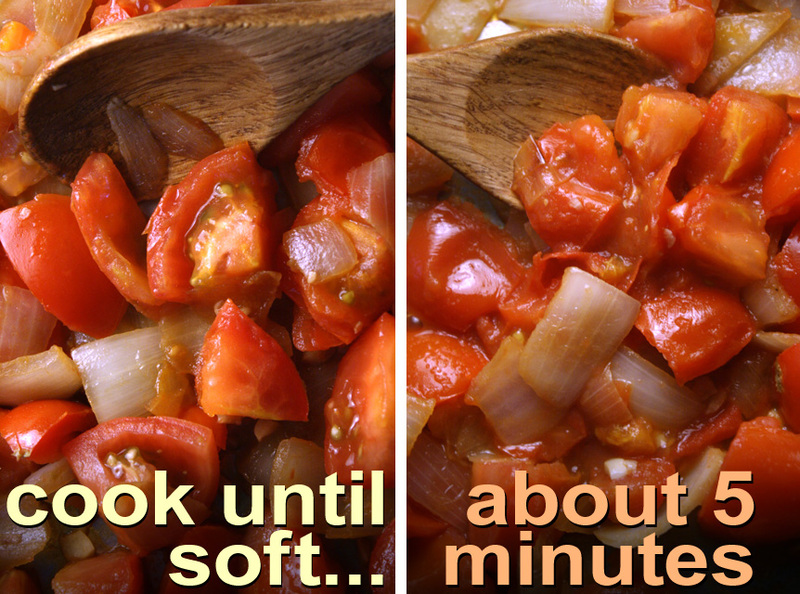 If tomatoes are whole then break them up - it should be easy to do. Pour in a can of coconut milk (juice or cream,) or plain yogurt. Mix well. Lentils should be done enough by now. 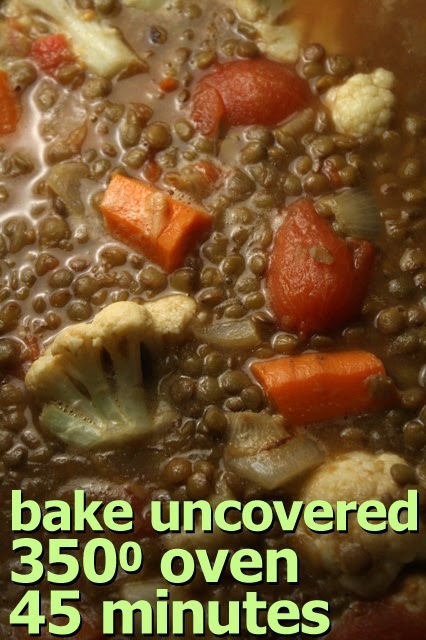 Remove lentils with a slotted spoon and reserve the liquid -- you may need the liquid for later, if lentil dish gets too dry in the oven. 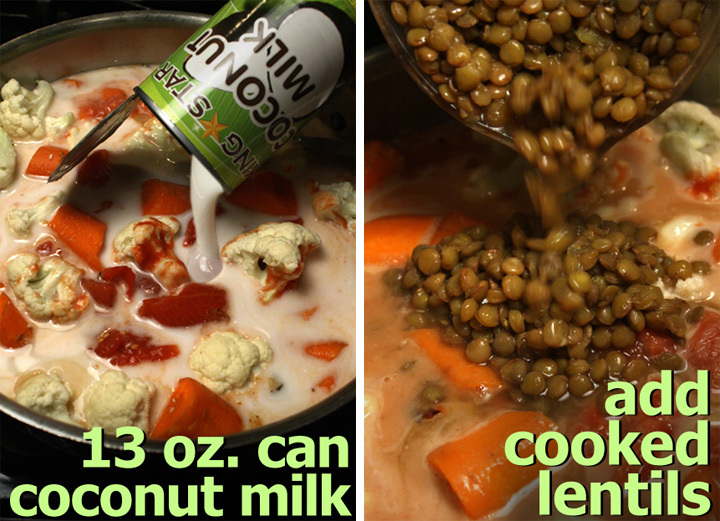 Add lentils to veggies and curry sauce. Bring to a boil. Now you can add the ovenproof pan (or pot) to a 350 degree oven. Bake uncovered for 45 minutes to one hour, (alternately, you can cover and simmer on the stove to, at a low heat, for the same amount of time.) Check on the dish from time to time to make sure liquid does not cook out. Add 1/4 cup of lentil cooking water when needed. 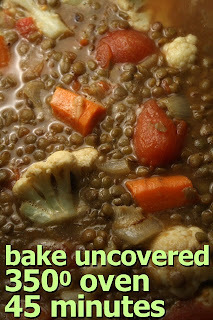 I made it without any extra liquid -- the coconut and tomato sauce thickened into a flavorful sauce as the lentils got softer and began to break apart. I have a couple of India sides that would go well with my Veggie Curry with Lentils, just click on a name to see the recipes: Coconut Rice and Saag Paneer. From hip to haute, and old school to ethnic, The 99 Cent Chef covers it all in his latest nighttime noshery survey, Restaurant Nocturnes IX. With more than 180 different restaurants photographed here during the last two years, this unique peek into L.A.'s evening victual ritual keeps getting better over time -- like fine (but inexpensive) California red wine. Listen in as locals order their favorites; or to a Maitre d' listing menu highlights. 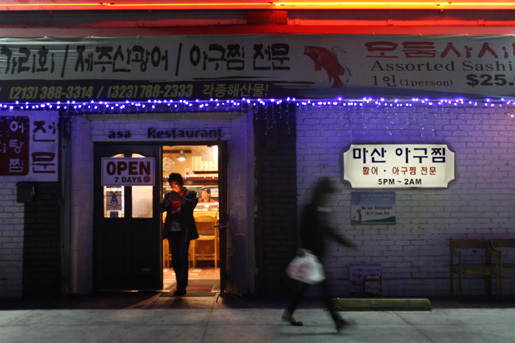 And feast your eyes on a vibrant array of restaurant facades lit up in nocturnal neon as patrons busily come and go. Voyeurism has never been so appetizing! 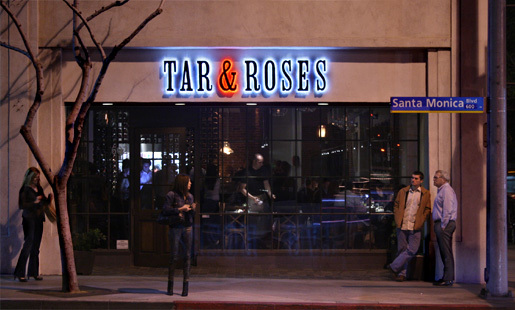 Included here is a baker's dozen (13) L.A. restaurants captured on audio and video for you to peruse from the comfort of your computer chair. Showcased is the coolest restaurant in West Los Angeles, ink., where tattooed owner/Chef du Cuisine Michael Voltaggio dabbles in molecular gastronomy. 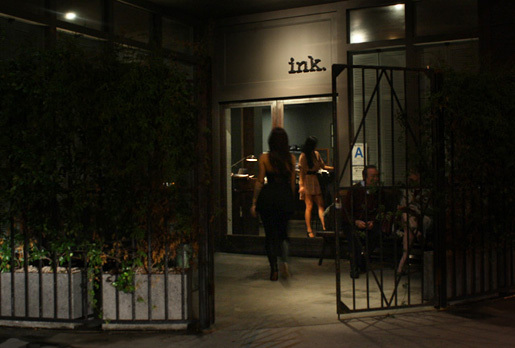 At ink, he serves an ever-evolving five-course tasting menu for $80 (the audio captured here is from early March). Grilled Monterey Squid, Foie Gras, Skate Wing, Beef Cheek and Carrots on a bed of Coconut Ice with a Coffee/cardamon Soil, anyone? Then again, sometimes all you want is something simple and satisfying and cheap, like a gooey bean and cheese burrito for $2.75 from Boyle Heights. 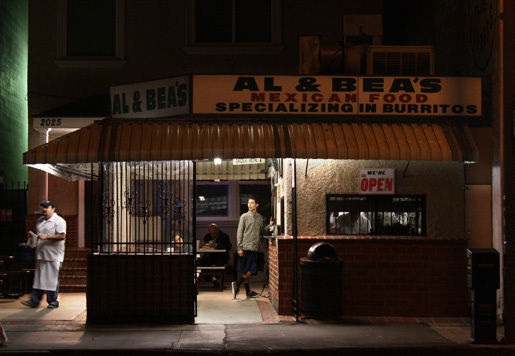 Check out the locals feasting at Al & Bea's, where they've been stuffing and folding burritos since 1966. After that, you''ll want to get back to familiar comfort food, and by that I mean soul food. I live in South LA, in Baldwin Hills, so I know the cuisine very well (be sure to watch one of my favorite local restaurant video reviews here.) Check out my 35- second video clip of the newest addition to our diverse neighborhood. A frequent guest on the Food Network, Chef Govind Armstrong (of Table 8 and 8 oz. 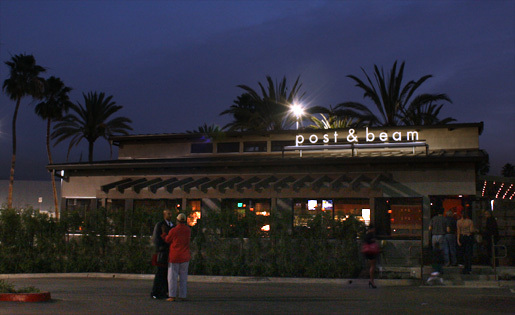 Burger Bar) just opened Post & Beam - his updated spin on traditional African-American cooking. Listen in as the hostess describes lip-smacking entrees including: Braised Boneless Beef Short Ribs, Cast Iron Natural Chicken, and Black-eyed Peas with Sweet Potato. 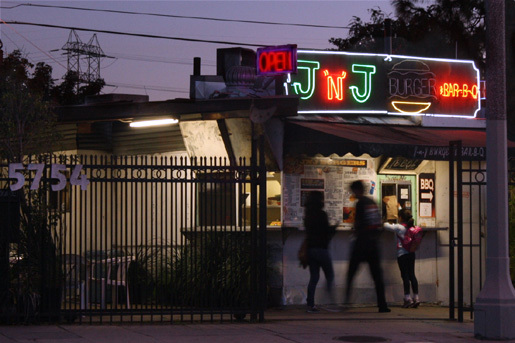 Or, you can get the low-down as the window order-taker, from J & J's Burger and BBQ joint on West Adams Boulevard, name checks all their succulent smoked meat highlights. 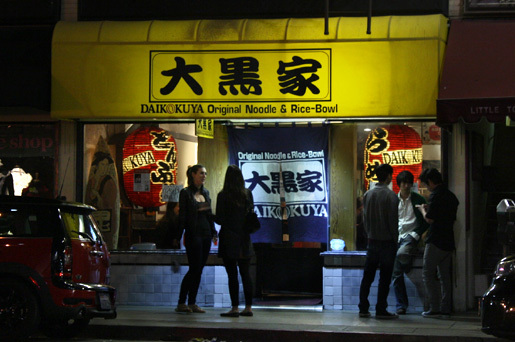 So whether you're curious about dining destinations for Japanese noodles and curry rice in Downtown LA, or Persian shish kabobs on Westwood Boulevard, I have some tasty leads in the video below. And as usual, I give you a list (in order of appearance) of the restaurants I shot, along with links to their websites -- if they don't have one, an online review link is provided. Just click on any restaurant name in my list below. And now, fasten your seat belt for the latest video by your midnight-rambling culinary local tour guide, The 99 Cent Chef. Play it here. Video runs 8 minutes, 33 seconds. Restaurant Nocturnes I, Restaurant Nocturnes II, Restaurant Nocturnes III, Restaurant Nocturnes IV, Restaurant Nocturnes V, Restaurant Nocturnes VI, Restaurant Nocturnes VII, Restaurant Nocturnes VIII.